Dalkeith's new management team of Darren Smith and Kenny Rafferty took The Jags to Musselburgh in the last of their pre-season warm-ups before the League Cup sectional matches start next Saturday. The Jags looked a different side to that which lost their last game at Olivebank towards the end of the season when the hosts clinched the league title. 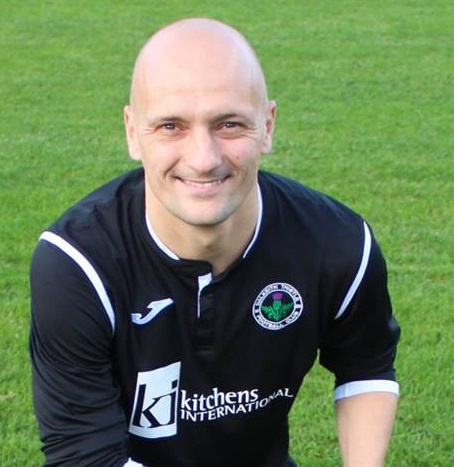 Darren Smith started the match in the middle off the park alongside Neil Jancyzk and starting positions were given to trialist center half Craig Meikle and Craig Wojtowycz. In a lively opening, The Jags were first to threaten when Duncan Muir burst through only to shoot straight at Cornett in the Burgh goal. Both sides were playing neat football but it was the Jags pairing of Smith and Jancyzk that looked the most likely to unlock the Burgh defense as the popped the ball around the park. Tansey saw an effort crash wide off the upright and Stewart Adams beat Cornett when through on goal but pulled his effort just wide, whilst at the other end James McQueen did superbly well to thwart Matti King turning a net-bound effort onto the post. The Jags took the lead with 5 minutes to go to halftime and it was that man Tansey with the goal latching onto a through ball holding off a defender before lifting the ball over Cornett. Into the second half and Shaun Murray came on for Ryan McQueenie. Musselburgh pressed forward and were rewarded with an equalizer after 5 minutes when McQueen couldn't hold a rocket of a shot from King and Deland was on hand to slam home from 5 yards. The Jags made a few more changes at this point bringing on Fairnie and young Cammy McBeth for Smith and Jancyzk. The game was still flowing from end to end but it was Dalkeith who took the lead again on 70 minutes. Tansey was fouled 30 yards out on the left and Wojtowycz delivered a fine ball into the box where Stewart Adams glance home a header from 10 yards. The Jags had the bit between their teeth at this point and should have extended their lead just 5 minutes later when Tansey burst clear down the left and unselfishly squared the ball to Stewart Adams who saw his effort cleared off the line by a covering defender. The Jags continued to press but from a corner, they were caught out by a swift Burgh counter-attack which ended with Maskrey nodding past McQueen. Both sides continued to press for a winner but the home side had the best chance to seal the win with the last kick of the ball when Burgh were awarded a penalty, however, King blasted his effort over the bar to leave the game all square.